Christians have long worshipped God through music. It is part of the Presbyterian tradition and is an integral part of our worship services at Manitowish Waters Community Church. If you are a singer, bell ringer, instrumentalist, organist, pianist, etc., we encourage you to share your musical talents with us. 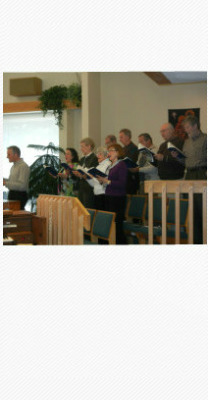 In addition to our choir and bell choir we enjoy and encourage offerings of special music by our members and guests. The choir meets for rehearsal one hour prior to the 9:3-0 AM Sunday service and then sings at the service. Members, visitors and guests are all welcome to "sing His praises" with one voice. Please join us on Sunday morning for rehearsal and the service to follow. About Our Choir Director . . .
Tom Schroeter has served as our church's choir director for 28 years. He received a Bachelor of Arts Degree from the University of Wisconsin-Madison in Music Education and Applied Voice. He studied voice at the Wisconsin Conservatory of Music in Milwaukee and in a master class program at the Tanglewood Music Festival in Lennox, Massachusetts. After receiving his degree, Tom taught 7th through 12th grade vocal and general music in the Random Lake School District. During that time, he was fortunate to sing with the Milwaukee Symphony Chorus. In addition to directing the Manitowish Waters Community Presbyterian Church Choir, Tom conducts the Campanile Chorus, a Northwoods chorale affiliated with the Campanile Center of the Arts in Minocqua, Wisconsin. He has also taught voice lessons at the Campanile Center and was an adjudicator for the Wisconsin State Music Association. Tom and his wife Susan moved to Manitowish Waters in 1983 to work in the family cranberry business. They have enjoyed living in the northwoods and raising two sons, Jesse and Joel.